A highly engaging executive, profound entrepreneurial and leadership experience, an undisputed visionary, always thinking beyond the immediate impact but long term global implications of any of the technology evolution he touched. For the next 7 years I enter again a new experience world, the world of Artificial Intelligence and autonomous machines. Like technology revolutions before it will – again – change our lives more radical than anything before. Axel Schultze is founder of the World Innovations Forum, and a startup investor. He was a very successful four times entrepreneur with four exits up to 9 digit figures, is a published author, patent holder, was named one of the globally most influential startup accelerators in 2015, won the SF Entrepreneur Award in 2008, chaired a Software and Information Industry Association, was an early adviser of LinkedIn in 2003 one of the first executives authoring a blog, a beta user of Twitter. Axel is an undisputed technology visionary looking always at global impacts. Axel Schultze is Board of Trustees and founder of the World Innovations Forum Foundation, a Swiss based Innovation & Entrepreneurship development NGO with representation in 27 countries. He is also founder of the Society3 Accelerator, helping young entrepreneurs to grow beyond the average. Prior to that he was a 4 times entrepreneur, founder and CEO of Silicon Valley based BlueRoads, one of the most successful Channel Management Software companies. In the late 90’s ee created the world’s first equity crowdfunding platform webstock. With the inception of the Internet, he was founder and CEO of Infinigate one of the largest IT Cyber Security provider in Europe, (today over $500 Million in revenue). 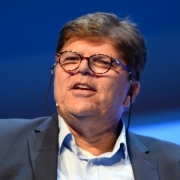 In 1983 he founded Computer 2000, the most successful European computer distributor, which grew to $5 Billion in revenue and merged with TechData in 1998. In 1983 he completely disrupted the then current distribution model by creating a business model that exclusively sold through authorized sales partners. What’s standard today was perceived to be impossible back then. His Computer 2000 company bypassed multi hundred million $ international distributors with only $50,000 seed capital. 10 years later Computer 2000 grew to $5 Billion in revenue, by far the largest distributor i Europe and the third largest in the world. In 2000 Axel founded BlueRoads a channel sales automation solution that was based on a so called Software as a Service architecture, just a few months after Salesforce.com. Two dominant player in that channel sales market had raised 68 and 72 Million dollar pre internet bubble. Initially no funding was possible because of those large competitors. Five years later outperformed BlueRoads both of them and became market leader. Today Axel focuses on “Autonomous Machines”, robots, computers or any machine that is driven by Artificial Intelligence. He is authoring the book “Megashift.AI”, assuming that unlike in the past, where new jobs were created with the inception of new technology, this time the new technologies are autonomous and won’t need a lot of people managing them. Autonomous trucks, no longer need truck driver. Autonomous operating production systems no longer need worker using them but working on their own. Autonomous, AI and 3D printing based home builder no longer need construction workers. Autonomous financial analytics systems no longer need bankers. However, Artificial Intelligence is boosting not only entirely new jobs but a whole range of new industries. Megashift.AI isn’t exclusively about AI, it is giving some perspective on the dramatic acceleration of dozens if industries. The new Innovations Age with dramatic parallel development power is the first time period in human history that brings “the next big thing” forward on a daily base. In 2000 he was asked by IDC Publication to give a glimpse into the future of the Internet and where it is going. His famous headline was “It is not the Internet that changes the world but all the applications that will run on top of it” He predicted the IOT rise by stating that any machine will one day be connected over the Internet. He shared some thoughts about new layers of the Internet without possibly knowing about Blockchain, the dark net and other layers. In 2019 he plans to publish “Megashift.AI” a journey through time from 2020 to 2050 and beyond exploring how AI will change the face of of our developed world like never before imaginable. In any case, you will need to pay all travel expenses.